Robert represents national and international corporate entities, financial institutions, unsecured creditor committees, and trustees in a wide range of complex commercial disputes in federal, state, and bankruptcy courts throughout the country. 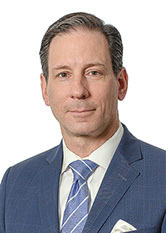 He has litigated, arbitrated, and mediated issues involving bankruptcy, business torts and related disputes (including partnership and LLC membership disputes), commercial leases, contracts (including complex credit agreements), employment (including non-compete agreements), insurance, securities, and trusts and estates. Robert is also very experienced in enforcing judgments against the assets of recalcitrant judgment debtors. Prior to attending law school, Robert became a Certified Public Accountant and worked for a “Big Four” international accounting firm, where he conducted audits of and provided tax advice to the firm’s corporate clients, and therefore, brings unique business experience to his litigation practice. Kassover v. Prism Ventures Partners, LLC, et al., Index No. 602434/05, slip op. (Sup. Ct., New York County 2017), aff'd slip op. (1st Dept. 2019) (order issued, over competing judgment creditor's objection, granting turnover of Florida based judgment debtor's interests in numerous limited liability companies to New York County Sheriff). FBI Wind Down Inc. Liquidating Trust v. Heritage Home Group, LLC, Adv. Pro. No. 15-51899 (Bankr. D. Del. ), aff'd 16-cv-00834 (D. Del. ), aff'd 17-2315 (3d Cir. 2018) (defeated defendant's motion to compel arbitration concerning a post-closing reconciliation dispute arising from the $280 million sale, pursuant to Bankruptcy Code § 363, of debtor's assets). Stout Street Fund I, L.P. v. Halifax Group, LLC, et al., 48 N.Y.S.3d 438 (1st Dept. 2017) & 48 N.Y.S.3d 443 (1st Dept. 2017) (DLJ Mortgage Capital, Inc.'s actual and constructive fraudulent conveyance affirmative defenses/counterclaims sufficiently pled and plaintiff's summary judgment motion improperly granted in connection with the fraudulent conveyance of numerous properties and related mortgages). Bank of Hope f/k/a BBCN Bank v. Nuvico, Inc., et al., Index No. 654577/16, slip op. (Sup. Ct., New York County 2016) (summary judgment in lieu of complaint granted in connection with $3.3 million in aggregate loans). Valley National Bank v. Cort & Medas Associates, LLC, Index No. 509326/15, slip op. (Sup. Ct., Kings County 2016) (summary judgment granted and order of reference entered on commercial mortgage loan foreclosure claims). X&Y Development Group, LLC v. Epic Tower LLC, et al., Index No. 707065/16 (Sup. Ct., Queens County 2016) (secured dismissal for Cathay Bank based upon, inter alia, a mortgagee not-in-possession defense). Signature Bank v. Liddle & Robinson L.L.P., et al., Index No. 0651223/16 (Sup. Ct., New York County 2016) (represented plaintiff in $3.8 million credit agreement-related dispute ending in a favorable settlement). Wells Fargo Bank N.A., as Trustee v. Sovereign Bank, N.A., 13 Civ. 1222 & 13 Civ. 4313, 2014 U.S. Dist. LEXIS 125274 (S.D.N.Y. Sept. 9, 2014) (secured judgment of dismissal and summary judgment in favor of originator/seller of a $1 billion commercial mortgage portfolio). The case was highlighted in the November 21, 2014 (Volume 27, Issue 14) edition of Commercial Lending Litigation News, a Thomson Reuters publication. DLJ Mortgage Capital, Inc. v. Kontogiannis, et al., 973 N.Y.S.2d 160 (1st Dept. 2013) (represented purchaser of mortgages in securing provisional remedies and $65 million judgment, and defeating competing creditors in judgment enforcement priority dispute). The Official Committee of Unsecured Creditors of American Home Mortgage Holdings, Inc. v. Deloitte & Touche LLP, Adv. Pro. No. 09-51596 (Bankr. D. Del. 2009) (represented plaintiff in $75 million malpractice, negligent misrepresentation, and breach of contract dispute ending in a favorable settlement). The Responsible Person of Musicland Holding Corp. v. Best Buy Co., Inc. (In re Musicland Corp.), 398 B.R. 761 (S.D.N.Y. 2008) (represented unsecured creditors’ interests in director and officer breach of fiduciary duty, fraudulent conveyance, and preference dispute ending in a favorable settlement mid-trial). TECO Electric & Machinery Co., Ltd. v. Sollito, et al., 08 Civ. 01542 (D. Ariz. 2008) (represented plaintiff in $20 million securities fraud dispute ending in a favorable settlement). In the Matter of the Application to Vacate the Decree Admitting to Probate the Last Will and Testament of Romaine Efros, 859 N.Y.S.2d 902 (Sur. Ct., New York County 2008) (decree vacated based upon undue influence). Spectra Sec. Software, Inc. v. MuniBEX.com, Inc., Index No. 604992/01, slip op. (1st Dept. 2003) (alter ego and fraudulent misrepresentation claims dismissed). Presentation on "The Demand Letter: Making Your Demand Stand." Presentation on "Avoiding Email Pitfalls." Presentation on "Enforcing Lenders' Rights and Remedies." While attending St. John's University School of Law, Robert was an Assistant Editor of the Law Review.